Friends keep asking me how I’m doing. It’s an understandable question, I suppose, given this is the summer Everything Changes. And maybe I’m misreading all those furrowed brows and sympathetic nods, but I’d swear it seems like they imagine me to be curled into the fetal position when I’m home alone, quivering in the corner of my closet sucking my thumb. Except I’m not. I’m fan.tas.tic. My oldest graduated college a month ago; my youngest graduated from high school two weeks later. My husband and I are official Empty Nesters but we won’t feel its full impact until my daughter heads west for a two-year Fellows Program in September and my son leaves for his freshman year in college. Then, their absence will fill canyons. Would you like to know why I’m doing so well? Because this is the way things ought to be. For 18 years a parent is obligated and privileged to steward their children’s lives. We’re on 24 hours a day for about 6,570 days, give or take. We teach and train and guide and direct and coach and carry and challenge and charge and request and command and demand. Just when you have a grasp of one season, things change. Imperceptibly sometimes, when you don’t even see it coming. Other times it’s a sledgehammer to the head…or worse, heart. One summer you’re slathering them in sunscreen, the next you’ll be handing them the bottle to do it themselves…and the next you won’t even have to remind them. That one lesson they learned the hard way was a grand teacher–who knew you could get sunburned there? Physical needs in those early years gradually inch toward emotional demand. When my youngest was born, the oldest of my three was just four. It was exhausting. I remember some days feeling like the breath of life was sucked out of me. Babies are a sweet sort of dementor* who’ll drain every drop of energy you’ve got. You wonder how in the world people with “more children” can do it; more children is just one more than you have. Children are handed a set of keys as they learn to read; and once they start reading to learn, you’ll thrill when they open new doors. You’ll hold your breath when they master two wheels, but the first time they drive off in four, you might stop breathing altogether. The hurt you feel with each skinned knee and stubbed toe will give way to an inextinguishable ache when feelings are wounded. Mamas become bears when injustice knocks. The days are long, so very long. But then one day, they’re not. I started praying for my children before they were born, and I suppose that will never stop. They sure give you plenty of reasons. It took a few seconds to absorb what he meant, but once I understood, I hated the thought. But it was transformative in my parenting in a good sense, a means of preparing me for where I am now. It takes about this long to get ready, but I’m not sure you ever truly are. But, like I said, this is the way things out to be, at least in our culture. You’re raising them to be independent, responsible, compassionate adults who’ll contribute to society through meaningful work and service; and because we follow Jesus, our hope and prayer is that they would follow Him, too (and mine are, despite their parents’ shortcomings). You and I are not raising our children to be dependent, irresponsible adults, indefinitely living under our respective roofs. If they’re without physical limitations or special needs, it is right and good they leave one day. Look at this picture. Can you tell me what’s dreadfully wrong? 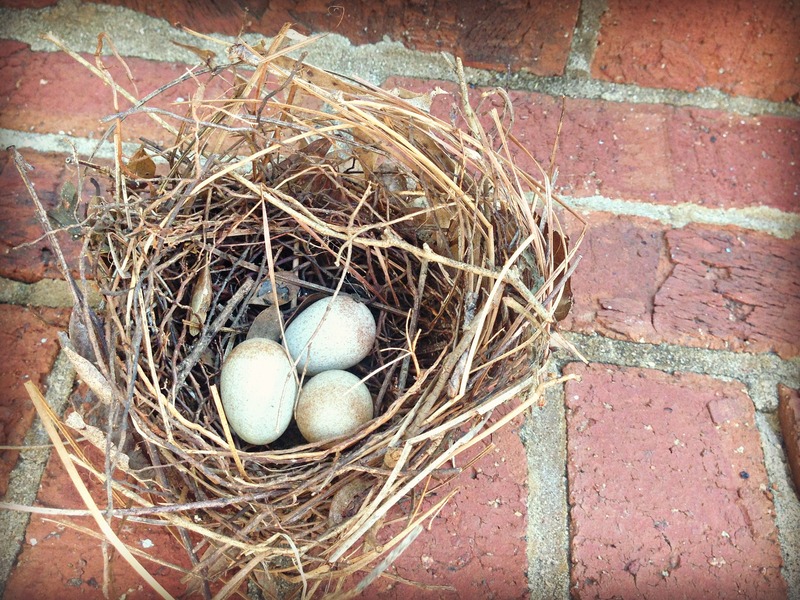 The nest is sitting on my brick stairs, not in the shrub where it was built. Upon discovering it after uprooting that shrub, we tried to woo the mama back by sticking the nest in an adjacent bush. The mama was frantic in those initial hours, and she even flew into the bush where we relocated her home and I thought we had saved their little bird family. 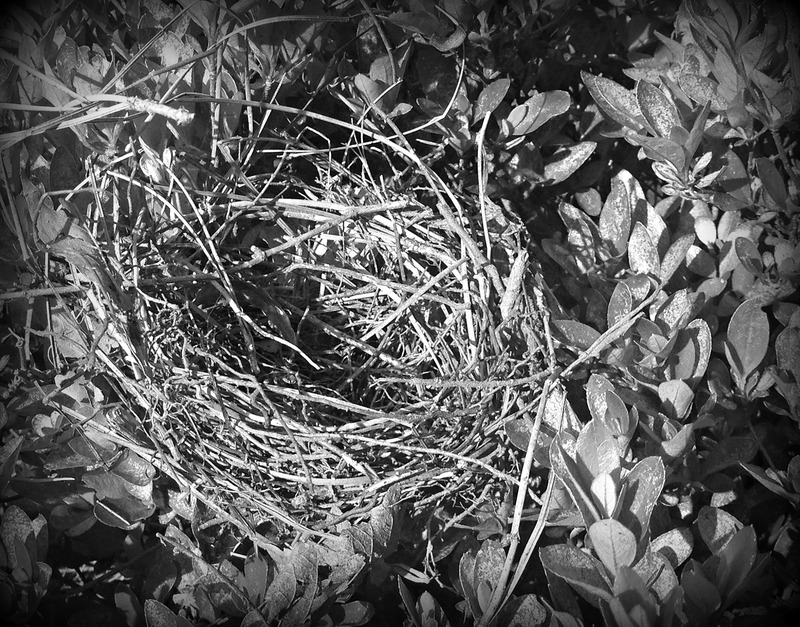 But it was short lived…day after day I watched over that nest, realizing after a week, she wasn’t coming back. Those precious little eggs were never going to grow up and leave that nest like they were supposed to. They were going to stay there forever, unhealthy and never reaching their potential. That nest preached a powerful word over me. Baby birds are created to grow up and fly away. 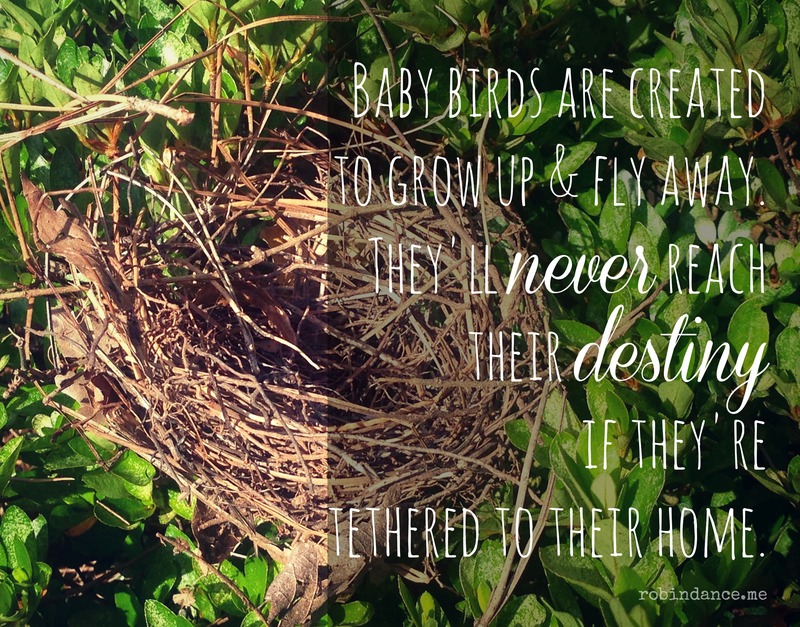 They’ll never reach their destiny if they’re tethered to their home. In other words, what may feel like loss is not loss at all. 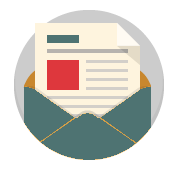 For your children to step over the threshold of high school graduation and to move on to the next season in their lives – be it college or job or military service, or even an intentional gap year – is cause for celebration! You’ve done well, mama or daddy! Your role is changing and your children will begin seeing you with different eyes. No longer are you walking in front of your children with them trailing in your wake; now, let them stand by your side. Maybe not as equals – they still want and need you as their parent more than they need you as their friend – but conversation will become more even if you let it, welcome it, invite it. I’m finding already, having two in college and beyond, that those 18 years of having my children under my roof, through consistent, intentional (albeit imperfect) parenting has earned trust. My children want to hear our counsel; not as the boss of their decisions, but to provide them sound advice. They’ve arrived at the conclusion that we love them without condition and more than anyone else, and that our previous counsel has proven wise. They’re seeing us with new eyes, yes, but they’re also listening with open ears. It doesn’t mean they follow everything we say, but they care about our opinion. Your children care about yours. It’s important to note that just because I’m doing well, doesn’t mean I’m not sad sometimes. Random things will make me cry — walking past my youngest’s room and seeing his ancient, filthy Pillow Pet sprawled on his neatly made bed, cooking a dish my daughter taught me how to make, my middle son’s empty room — but it would be a disservice to all of us if that was where I lived. I understand how many fall into a pit during this transition, I do…. You’ve invested time, energy, love and attention into your children; no doubt you’ve sacrificed much in the process. In many ways you surrender your own dreams to make way for your children’s…for a while, anyway. But if you’re like me one day, when your children are launching and it’s awfully quiet in your home, you have a choice to make: to celebrate or mourn. I want to tell you right now, this is a new day. All this life you’ve been living to get you where you are, serves purpose. You know things. You know things that those coming behind you do not know, cannot know, because they haven’t lived it. This is not a season of loss but great gain. You have time you have not had, you have capacity and margin that for a long, long while didn’t exist. Whether you realize it or not, you have been accumulating a wealth of knowledge of immense value through experience and life. You can not move forward if you’re only looking back. In recent years if there’s one lesson I’ve learned, it is “Life is what happens when you’re busy making other plans.” In many ways, what I’ve thought I’ve wanted has eluded me, and what I’ve received I could never have anticipated. While I don’t know with surety what my future holds, I’m standing on the edge of something new, and I’m eager and expectant. I believe that if God is who he says he is, what awaits is ultimately for my good and his glory. This is beautiful and speaks to me in a way that gives me hope as my kids are 6 and 8 and the years seem to be flying by already. Thank you. I have such a strong compulsion to encourage those who are heading my way–I SO hope you sense that! I can’t believe I’m “here” but this huge responsibility to steward well what I’ve learned is prompting me to begin sharing thoughts I’ve had for a while now. Thank you for commenting and sharing my post already; I haven’t been writing much, but it’s because I’ve been living much :). Oh friend… I love this so! Honestly – I think all of my friends thought I too would be in the fetal position too. My only Girlie and I – we are tight… (and graciously – she moved out a year ago – but lives just down the road for now! – like, literally –five minutes away!) I think even she was surprised that the transition was harder on her than it was on me/us… but we are feeling rested and ready for Act Two! 🙂 It’s good… this life and all of its’ seasons! Praying for y’all… celebrating, too! I love this… Launching # 5 … The baby… We have a big age span… Oldest is 32… Expecting her 3rd girl this fall… I have homeschooled them all… 27 yrs total… So I am doing cartwheels… I have lost count how many times I have been asked…how are you …what are you going to do… I have moments of sadness too… But I am excited to see the joy In my kids as they launch… Choosing to celebrate instead of mourning… My hubby and I just got back from a week in Charleston… Just the two of us… Sweet practice of this empty nesting thing… And we are going to be really good at this???? … I think sometimes we look backwards and think the best is behind us…but in walking with God… The one who never stops creating… The one who will continue to paint a beautiful tapestry in our lives… Fantastic indeed!!! Thanks for giving positive words to this space of life!!!! Wow, Ro…you’ve been at this thing a lonnnng time :). SO glad y’all got to enjoy Charleston–it’s one of my favorite cities on the planet. It IS easy to fall into the trap of rearview mirror-looking, usually w/rose-colored glasses, to boot! In recent months, I’ve really seen how all my past life experiences serve my future, and I’m excited how that will translate into practice. I have this expanded capacity of loving women and wanting to encourage them during those hard, tedious, amazing years with children at home. Wow!! This is exactly where I’m at. People act like I’m a bad parent because I’m not weeping every day. Just like you I have moments hit me hard but I make the choice to rejoice for and with my sons. When we dropped our first son off at college and drove away I couldn’t hold back the tears anymore. My husband (who isn’t always the best with words) grabbed my hand and said “you did good Mom”. It meant the world to me! I get this! We are in the completely empty nest stage and LOVING it! (My About Me page on the blog describes some of our fun!) Yes, there are moments I mourn, but mostly it’s a grand celebration of two! And isn’t it okay to celebrate AND mourn? Heck yea! You sound like you’ve landed in the mostly celebrating’ corner :). Fantastic 😉 :). 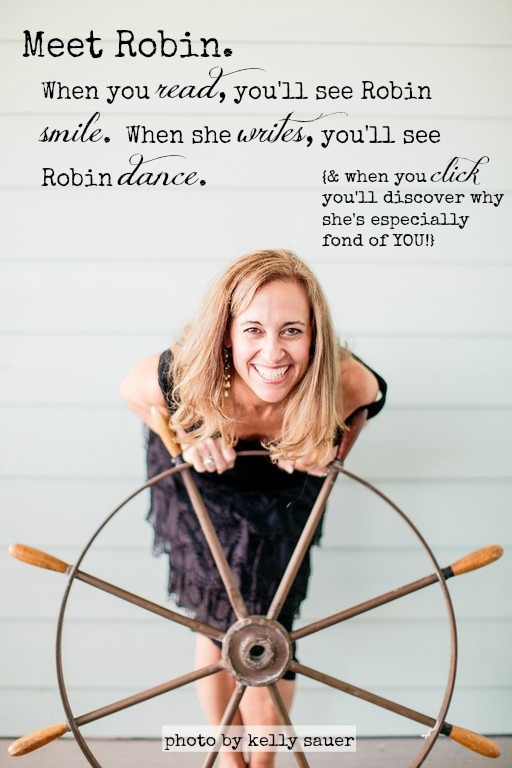 Sweet Robin, I love this post!! I’ve been walking the empty nest road for about 8 years now and honestly, it was tough in the beginning–probably because I’m the mom of an only with no backup siblings:) –but in those 8 years I’ve found God has more for me than motherhood. He reminded me being a mom was one of the roles He created me for but not the only one! It wasn’t until after Franny moved away to Nashville and started her career that I was free to 1-write a book, 2-start a blog 3-do more life and travel with my husband. Our role changes. I call this time of life the After Party! It’s where we discover all the other things we were created to do! If we’re doing it right, we’re raising them to leave. We’re training them to live on their own, cheering them on from the sidelines when they go. And that’s the hardest part. Because they do go. Because mothering is a journey of letting go. A holy release made possible only by holding on to the One that matters most…. Kate!! AFTER PARTY!!! I. LOVE. THAT! You’re one of those friends with whom I’ve crossed paths on the internets I’d really like to spend time with, because we’re in a similar stage of life AND from what I’ve seen, we’d jive just fine :). You’re a little ahead of me, and I like that–but close enough that I share the view. Anyways…thanks for chiming in; your words are light and life :). Love this…”mothering is a journey of letting go. A holy release made possible only by holding on to the One that matters most…” I never truly “got” this until later in the mothering journey, which made the launching tough. Thank you for those words. I hope to be able to encourage and lead others, as Robin is doing, as they head down this path so that they are better prepared than I was! I enjoyed reading your blog. Wonderful thing to think about. I married my husband a little over 2 years ago and just experienced an older son and daughter of mine moving out. I thought I was going to stop breathing it hit me so hard. My husband has 4 children, which are now mine too, in which 3 of them were already moved out before I came. He is, by now, used to it. This really helped me to see the better side of the children leaving the nest. It, also, helped me to realize I have work to do now until then. Thank you for taking time to read; I never take that for granted and I’m very grateful. If my words have given you “thinkin’ space,” well…that’s a honor for me! Change and life transitions are typically a challenge; we all could use a little encouragement along the way :). I appreciate your encouragement and the suggestions for the way to look and behave at this time of our life. Our youngest son just graduated college. Our older two sons just got married within a year and a half of each other (2012 and 2014). I was one of those who fell into the pit and had to go through a period of grieving. And from what I’ve learned, this is perfectly natural. As long as the grieving is a process that leads to a new, improved phase in your life, it’s not all wrong. And it’s not wrong to skip the celebrating at first. Even though we know in our heads that “this is the way things ought to be”, it certainly doesn’t mean that our hearts are ready to accept the inevitable. I felt like it needed to be put out there that if someone is hurting or grieving, it’s not completely unusual and can be overcome. Robin, your positive points about the milestones we need to consider will help all of us focus on the good and glory that God has planned for us! First, I’m so glad you wrote this! I don’t mean to insinuate something is wrong with grieving for a season; mamas invest everything they have into their children, and to suddenly find yourself in a new role IS a seismic shift! To NOT have an emotional response is highly unlikely! Mostly, my heart in writing was to encourage mamas not to stay in that pit. Recognizing in advance there are going to be battle-worthy feelings gives you time to prepare for that season. Of course, like anything, you can only prepare so well, and the truth of it might be different than imagined (not necessarily “better” or “worse” just different….). Thank you! And I’m sorry if I sounded sensitive…I’m so grateful to have found you and your blog where I can find encouragement and learn how to lead others down this road. I openly admit to being jealous of those who seem happy and successful at launching their kids and running happily into this next stage of life. 🙂 I am lucky to have a wonderfully supportive husband and we are beginning to understand how much fun and adventurous this next stage is going to be for us! You KNOW I’m right there with you, friend! I’m having a quiet summer around here as our youngest just left for 8 weeks, our middle is home but taking classes and gone most of the time, and our oldest doesn’t live here anymore. It’s an adjustment, but it’s good. You have hit everything I have thought/believed/written about over the years. Love walking through this journey with you! I too feel a loss as I leave my eldest far away as she launches her new life! I praise God for His presence & leading. And it’s very ok for me to feel a loss. I’m lifting up all the mommas in this same season.